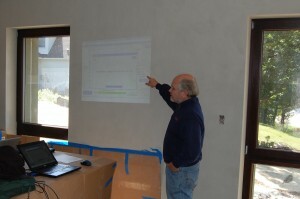 The Passive House in the Woods project is now listed on the “Built Passive Houses” website. This page holds a lot of specs about the building and is a great resource for built Passive House projects around the world. 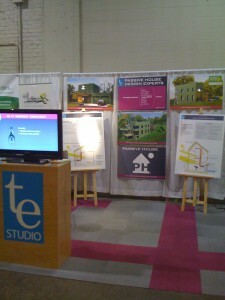 We are in booth U21E and S7E on the upper floor of the Living Green Expo this weekend. 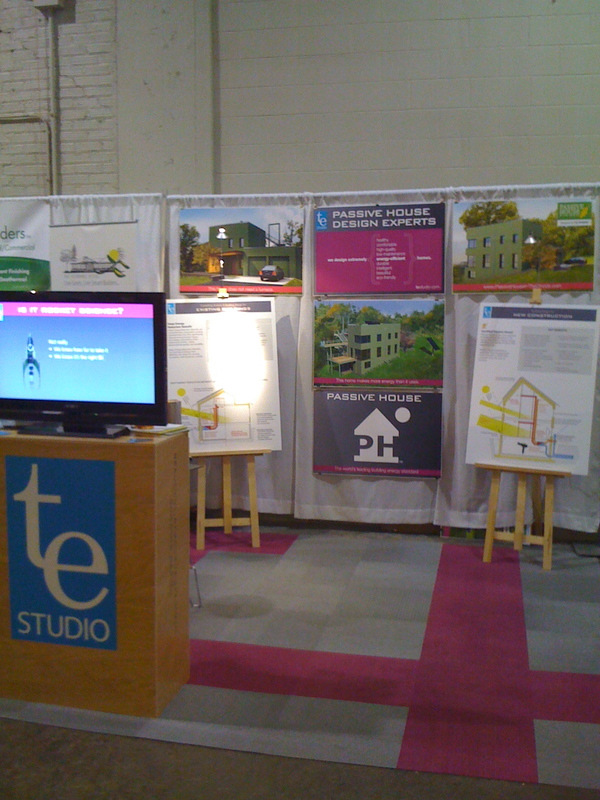 We’ve had lots of enjoyable conversations about Passive House and energy-efficient building design. Come join us—it’s free! Tomorrow, Sunday, we’ll be there from 10 until 5pm. The Passive House in the Woods is a 1,900 square foot two-story single family home with walk-out basement level, and a rooftop terrace. It was commissioned by a private client and designed by TE Studio. It sits on just over one acre in the Town of Hudson, WI—minutes from interstate 94. Located on the outer edge of a residential development, the home overlooks the St. Croix river valley. The building lot provides stunning views and prime passive solar exposure. The property’s north boundary is heavily wooded and borders undeveloped land. 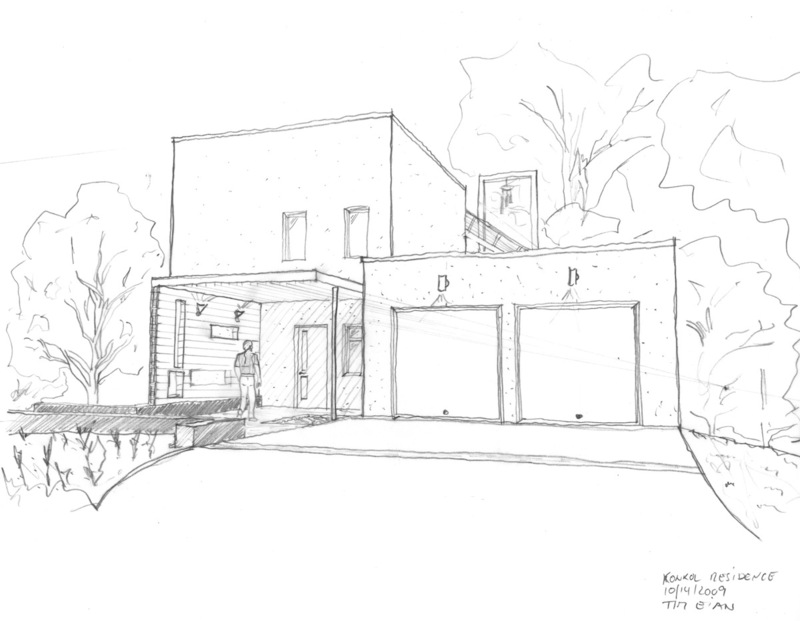 The design of the house works with the natural landscape, and minimizes impact on the wooded character of the lot. Exterior walls, windows, doors, slab, and roof designed according to Passive House principles can radically reduce the amount of energy used to condition a building. The exterior wall assembly of the Passive House in the Woods consists of 11” Insulated Concrete Forms (ICF) for structure, and an 11” Exterior Insulation and Finish System (EIFS) facade with an overall R-value of 70. Windows and doors are Passive House certified, come with triple pane low-E coated glazings and insulated frames for installed R-values of 8, and solar heat gains of over 60%. The slab sits on 12” of extruded polystyrene insulation with an R-value of 60. The flat roof utilizes an average of 14” of polyisocyanurate insulation with an R-value of 95. 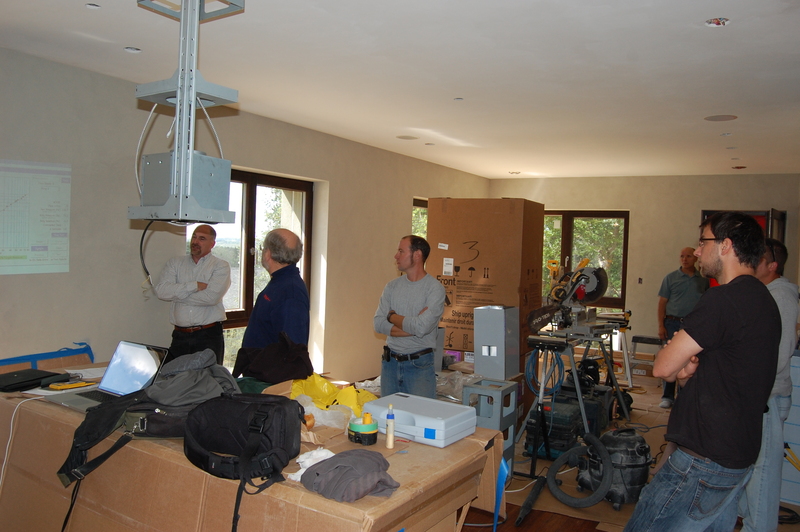 The mechanical system in a Passive House is typically centered around a heat-recovery ventilation machine. In milder climates, this system provides all the necessary heating energy, as well as outside air needed for balanced hygienic ventilation. 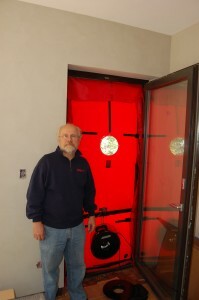 The heat-recovery ventilation system in the Passive House in the Woods consists of a high efficiency heat-recovery ventilator, combined with a 600 foot PEX-tubing loop field—buried on the property—to pre-heat and pre-cool the incoming air stream. This also dehumidifies moist summer air. In extremely cold climates, the paradigm of heating with ventilation air changes slightly. The overall annual energy goals for Passive House can be met but the extreme cold winter temperatures require a small additional heat source. Electric in-floor heating mats with local room-air thermostats are used to provide about 3kW or 10.5kBtu*. That compares to the energy draw of two hair-dryers. Renewable energy systems are optional and not required by the Passive House standard. Our client chose to achieve a net energy positive energy balance and carbon neutral operation. A 4.5kW photovoltaic system generates a surplus over the energy consumed on site, avoiding 2.78 tons of CO2 annually*, and therefore providing carbon neutral operation for a household of two people*. The domestic hot water system utilizes a 40 square foot hot water solar collector on the roof to pre-warm water in a 50 gallon storage tank. It is capable of providing over 85% of the hot water used in the home*. Backup heating is provided by a small electric on-demand water heater. 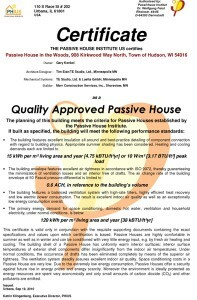 The Passive House in the Woods is registered with Minnesota Green Star and designed to achieve a gold rating. Meet the design and construction team by clicking on The Team link at the top of this page. Currently, there are only about a dozen certified Passive House(TM) buildings in the U.S. 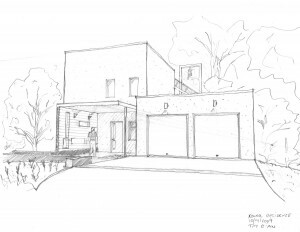 The Passive House in the Woods is slated to become the first certified Passive House(TM) in Wisconsin, and one of only a few net energy positive and carbon-neutral buildings in the country. It blends economy, ecology, health and durability in ways only Passive House can. The project sets out to demonstrate that this level of performance and quality can be achieved with today’s technology—even in an extremely cold climate. The Passive House in the Woods is a unique show-case. Ground braking happened on December 3, 2009. 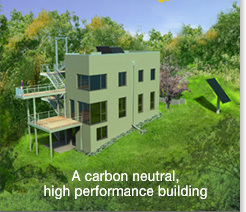 The Passive House Standard is the most rigorous building energy standard in the world. Consultants, projects or building components that have obtained the right to carry the logo have committed themselves to design excellence and the Passive House energy performance criteria. *Performance figures are based on Passive House Planning Package 2007 calculations.